The Tulsa Foundation for Architecture (TFA) has formed a Modern Tulsa committee to increase awareness of the city's architectural treasure since the Art Deco period. The group will be holding their first soiree on May 8, 2008 and the public is invited. "Modern Tulsa is a volunteer endeavor focused on enhancing the appreciation of Tulsa's 20th Century Modern Design and Pop-Culture Heritage. Operating as a committee of the Tulsa Foundation for Architecture, Modern Tulsa aims to perpetuate Tulsa's Modern Heritage via promotion, preservation and education." 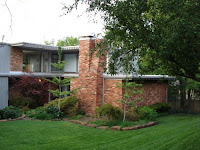 This modern mixer will be held at the Fadem residence, an early Sixties home featured in Tulsa People last July. The Fadems also operate Retro Redo, which specializes in the restoration of mid-century furniture. TFA may be familiar to some of you as the organization behind the reprinting of Tulsa Art Deco, a book documenting many of Tulsa's treasured Art Deco buildings through the photography of David Halpern. Originally published in 1980 by the Junior League of Tulsa, the TFA sponsored an updated second edition in 2001. For more information on the Modern Tulsa committee or the upcoming event call TFA at 918-583-5550 or visit www.moderntulsa.com.